Idaho has over 7,200 miles of snowmobile trails, more than any other western state, Idaho ranks among the region’s top sledding destinations. . Twenty-nine grooming programs located throughout the state will guide you through some of the most spectacular scenery you’ll ever see. Millions of acres of open riding exist on Forest Service, Bureau of Land Management, State and private land. Run free through freshly blanketed valleys, across frozen lakes, and wide-open plains. 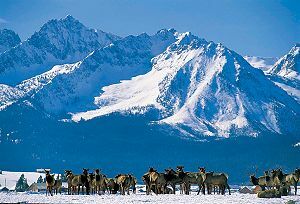 Gas, food, and lodging are nearby in friendly Idaho towns, and many resorts and guest ranches welcome snowmobilers. Idaho borders Yellowstone, so skip the crowds and crank up the fun throttle. Many of Idaho’s trails are interconnected, allowing for virtually endless riding. There’s plenty of dry, untracked powder to be found, and no shortage of breathtaking mountain vistas, either. Elevations range, from 1,000 to 10,000 feet, making for considerable variation in terrain throughout the state. There are plenty of dealerships, clubs, and services catering to snowmobilers, and the state government is fairly supportive of the sport. On or before November 1 of each year, the owner of each snowmobile must register the snowmobile with the Idaho Department of Parks and Recreation (IDPR). IDPR or its authorized vendors issue the owner a registration. The registration fee is $32.50 for personal machines, $62.50 for rental machines (a $1.50 vendor fee is included in those figures). The owner has the opportunity to designate the registration fees to the county snowmobile program of his/her choosing. IDPR sends 85% of the registration fee to that county (15% of the registration fee goes for administrative costs). All registrations are valid from November 1 to October 31 of the following year. Each snowmobile must be registered before it leaves the premises at the time of sale from any snowmobile dealer. The purchaser of a used snowmobile, which has been previously registered, must transfer the registration within 15 days of the sale. The department or its vendors will prepare a new registration with the purchaser’s name and address. The transfer fee is $4.50. Applications for an Idaho title must be filed at the nearest county assessor’s office. Where Can I Register My Snowmobile? Snowmobile registration vendors in Idaho are organized by county. Snowmobile registration stickers can be renewed annually at any of the locations listed in the documents above, by mail or online. See your registration renewal notice for additional details. What are the county snowmobile and state snowmobile accounts? Each county with a snowmobile program is entitled to 85% of the registration fees designated for that county. The money may only be used for county snowmobile programs. The moneys are used for the maintenance and operation of snowmobile trail groomers, signing of snowmobile trails, plowing parking lots, and maintaining warming shelters. Up to 15% of the state snowmobile account generated each year may be used by the department for administrative costs, such as the cost of the sticker and mailing renewal notices. 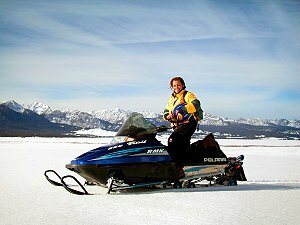 What is the county snowmobile advisory committee? The County commissioners of any county with a designated snowmobile program appoint a snowmobile committee to serve in an advisory capacity relating to the spending of moneys in the county snowmobile fund. Any person selected to be on the committee must be an active snowmobiler. Contact your county commissioners for information on your county snowmobile advisory committee. The registration stickers must be placed on the right and left side of the cowling of the snowmobile and be visible and legible at all times. Placing the registration stickers on places other than the right and left side of the cowling invalidates the registration. 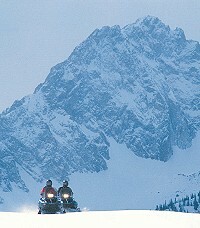 For more information, contact Idaho Parks & Recreation at 208-334-4199 or the Idaho State Snowmobile Association (http://www.idahosnowbiz.com).